Stained glass mosaics also names tiffany glass mosaics which come from overseas’s Tiffany glass, tiffany glass had more than thousand of year histroy. Louis Comfort Tiffany was born in New York City, the son of Charles Lewis Tiffany, founder of Tiffany and Company, and Harriet Olivia Avery Young. He attended school at Pennsylvania Military Academy in West Chester, Pennsylvania, and Eagleswood Military Academy in Perth Amboy, New Jersey. His first artistic training was as a painter, studying under George Inness in Eagleswood, New Jersey and Samuel Colman in Irvington, New York. He also studied at the National Academy of Design in New York City in 1866–67 and with salon painter Leon-Adolphe-Auguste Belly in 1868–69. Belly’s landscape paintings had a great influence on Tiffany. Tiffany started out as a painter, but became interested in glassmaking from about 1875 and worked at several glasshouses in Brooklyn between then and 1878. In 1879 he joined with Candace Wheeler, Samuel Colman, and Lockwood de Forest to form Louis Comfort Tiffany and Associated American Artists. The business was short-lived, lasting only four years. The group made designs for wallpaper, furniture, and textiles. He later opened his own glass factory in Corona, New York, determined to provide designs that improved the quality of contemporary glass. Tiffany’s leadership and talent, as well as his father’s money and connections, led this business to thrive. In 1881 Tiffany did the interior design of the Mark Twain House in Hartford, Connecticut, which still remains, but the new firm’s most notable work came in 1882 when President Chester Alan Arthur refused to move into the White House until it had been redecorated. He commissioned Tiffany, who had begun to make a name for himself in New York society for the firm’s interior design work, to redo the state rooms, which Arthur found charmless. Tiffany worked on the East Room, the Blue Room, the Red Room, the State Dining Room, and the Entrance Hall, refurnishing, repainting in decorative patterns, installing newly designed mantelpieces, changing to wallpaper with dense patterns, and, of course, adding Tiffany glass to gaslight fixtures and windows and adding an opalescent floor-to-ceiling glass screen in the Entrance Hall. 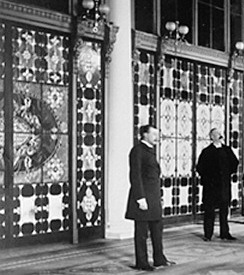 The Tiffany screen and other Victorian additions were all removed in the Roosevelt renovations of 1902, which restored the White House interiors to Federal style in keeping with its architecture. A desire to concentrate on art in glass led to the breakup of the firm in 1885 when Tiffany chose to establish his own glassmaking firm that same year. The first Tiffany Glass Company was incorporated December 1, 1885, and in 1902 became known as the Tiffany Studios. In the beginning of his career, Tiffany used cheap jelly jars and bottles because they had the mineral impurities that finer glass lacked. When he was unable to convince fine glassmakers to leave the impurities in, he began making his own glass. Tiffany used opalescent glass in a variety of colors and textures to create a unique style of stained glass. He developed the “copper foil” technique, which, by edging each piece of cut glass in copper foil and soldering the whole together to create his windows and lamps, made possible a level of detail previously unknown. This can be contrasted with the method of painting in enamels or glass paint on colorless glass, and then setting the glass pieces in lead channels, that had been the dominant method of creating stained glass for hundreds of years in Europe. The First Presbyterian Church building of 1905 in Pittsburgh, Pennsylvania, is said to be unique in that it uses Tiffany windows that partially make use of painted glass. Use of the colored glass itself to create stained glass pictures was motivated by the ideals of the Arts and Crafts movement and its leader William Morris in England. Fellow artists and glassmakers Oliver Kimberly and Frank Duffner, founders of the Duffner and Kimberly Company and John La Farge were Tiffany’s chief competitors in this new American style of stained glass. Tiffany, Duffner and Kimberly, along with La Farge, had learned their craft at the same glasshouses in Brooklyn in the late 1870s. In 1889 at the Paris Exposition, Tiffany was said to have been “overwhelmed” by the glass work of Émile Gallé, French Art Nouveau artisan. He also met artist Alphonse Mucha. He trademarked Favrile (from the old French word for handmade) on November 13, 1894. He later used this word to apply to all of his glass, enamel and pottery. Tiffany’s first commercially produced lamps date from around 1895. Much of his company’s production was in making stained glass windows and Tiffany lamps, but his company designed a complete range of interior decorations. At its peak, his factory employed more than 300 artisans. Recent scholarship led by Rutgers professor Martin Eidelberg suggests that a team of talented single women designers – sometimes referred to as the “Tiffany Girls”– led by Clara Driscoll played a big role in designing many of the floral patterns on the famous Tiffany lamp as well as for other creations. Tiffany interiors also made considerable use of mosaics. The mosaics workshop, largely staffed by women, was overseen until 1898 by the Swiss-born sculptor and designer Jacob Adolphus Holzer. In 1902, Tiffany became the first Design Director for Tiffany & Co., the jewelry company founded by his father. 1911 saw the installation of an enormous glass curtain fabricated for the Palacio de Bellas Artes in Mexico City. It is considered by some to be a masterpiece. Tiffany used all his skills in the design of his own house, the 84-room Laurelton Hall, in the village of Laurel Hollow, on Long Island, New York completed in 1905. Later this estate was donated to his foundation for art students along with 60 acres (243,000 m²) of land, sold in 1949, and destroyed by a fire in 1957. Il prossimo: Qual è lamina d'oro? È vero oro lamina d'oro?